We offer firewood for local pickup only. We do not deliver. A cord is 128 cubic feet of stacked wood. Cubic feet are derived by multiplying L x W x H. A cord is most generally thought of as 4′ x 4′ x 8′ but can be any 3 dimensions multiplied to equal 128′. At Wonser Woods, we do not display our wood in stacked cords. 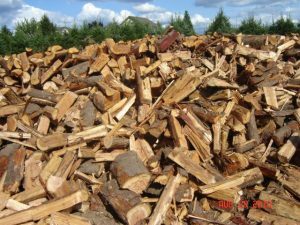 Our wood is piled, and we allow you to load whatever fits in your vehicle. We then calculate the cubic feet you have loaded as a percentage of a cord, and pro-rate the cord price. For example, if the bed of your Toyota pickup is 6′ x 4 ½’ and you stack the wood 1 ½’ high you will have 6′ x 4.5′ x 1.5′ = 40.5 cubic feet. On a Toyota pickup we allow 4 cubic feet for wheel wells, so the portion of a cord you take will be calculated as follows: (40.5 – 4) /128 = .285. This percentage is then multiplied by the price per cord to arrive at the amount you owe. All wood is Douglas fir and cut to 16” lengths. We are SOLD OUT until further notice.